The samba is a polyrhythm and a dance related (the word "samba" comes from the African word "semba" meaning "navel hit" in Bantu), in a global measure with 2 beats (2/4), punctuated by two surdos (large drum played with a "bat", "beater"), the high surdo marking the on-beats (the first) and the low, the off-beats (second), which is typically African (the inverse of rock and European drums in general). Some instruments have a basic figure in one beat cycle (4 strokes or 4 sixteenth notes (semiquavers) with accent on the beat) as the shakers (ganza, chocalho, etc. ), the reco-reco or the triangle, but most have a basic pattern in 4 beats or even 8 (apito (whistle)). Note that the Samba has a dance step of African tradition, very common, but is danced with high-heeled shoes to use the slip of leather soles on a smooth floor (parquet, asphalt, which boosts the efficiency and speed (one step by sixteenth note! ): see photo: Gracyanne Barbosa, queen of carnival of the samba school Mangueira at Rio carnival in 2008, making this dance step with this so typical swaying hips): a cultural mix of genius simplicity and efficiency, in my opinion, that combines twice two cultural extremes (Europe and Africa, recent invention (high-heeled shoes) and oldest (barefoot!)). The samba is certainly one of the oldest typically Brazilian musical forms with an Afro-Amerindo-Portuguese mix (unfortunately often forced by the colonizers and slave masters, to annihilate communautarianism and specific and multiple cultural identities of slaves and other poor Brazilian social classes, and thus, meetings and dissident nationalisms which could ensue). The form, rhythms, playing techniques and melodies were surely "classicise" in a long spontaneous process from an amateur practice first to perpetuate African culture in secret or even rebel circles (capoeira, afoxe, maracatu, etc. ), then devoted almost exclusively to the carnival, with almost one century of practice to achieve in my opinion a peak in the 1950s, with the band leader "Mestre André" (the inventor of the quick stop and restart "break" of batucada) and the samba school (in the sense of "artistic doctrine") "Mocidade Independente de Padre Miguel"are probably the most iconic, virtuosic and creative (but we often dates the appearance of samba to the 1920s, with the first officialized carnivals). Concentrated mainly in Rio de Janeiro in its "favelas" (poor districts, which unfortunately still exists), this Brazilian music has a sophistication never reached historically, to my knowledge (and I have studied many traditional polyrhythms of the whole world and the whole History (known)), on the polyrhythmic aspect, that is to say the number of different rhythmic voices that can overlap at the same time. Indeed, not only each instrument has a different basic figure from others, but in addition, each musician in the band (which can usually gather over a hundred musicians marching together at the Rio carnival) is supposed to improvise! If the result is not cacophonous, it is through a very ingenious hierarchy of the figures according to the timbre, sound power, playing constraints and the natural height of the instruments, but also by a system of limitation of improvisation, which prioritizes after the basic figure, "standard variations" for each different instrument, or secondary or tertiary variations that vary from just a few notes and complement each other, to reform a new basic pattern, sum of previous and also thoughtful. Improvisation here is more limited to a choice than a real personal invention. That's why I thought it was interesting to present the samba by using two specificity of Internet: multimedia and interactivity. To open the animation in a new window, click here.To open the animation in a new window, click here. Careful: loading the page (6.5 MB) may take some time, thank you for your patience! Indeed, you will be able to choose the instruments and rhythms that you want to hear, simply by checking the corresponding boxes in advance with a mouse click, then launching the song (which lasts only 8 bars of 4/4 measures (with 4 beats) without counting the start-up figure, which lasts one measure). You can also choose to select all (15 voices and 14 different instruments). Only tamborim is doubled because it has classically two complementary basic figures which the second is identical to the first but shifted (probably inspired by an accident). 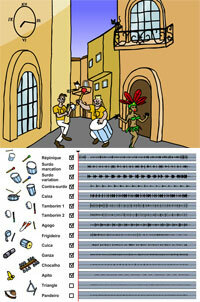 I also give an example of a full street batucada ("de enredo", parade, carnival), removing just the two less sounding instruments and therefore less used in this context (pandeiro (tambourine with jingles) and triangle). I also propose two typical examples (by no means exhaustive) of reduced harmonized groups with instruments adapted to the decrease of volume thus induced. The "Pagode" means a friendly music, traditionally played during or after a meal, in cabaret or on the beach, and therefore instruments with low volume to not hide the singer's voice or the sound of acoustic guitars, and can be played sitting down. This gives a very special color, intimist, so specific to cabaret and sentimental and melancholy songs, which surely inspired "bossa nova" in the 1960s. The advantage of interactivity, finally, is that it allows thousands different combinations of voices, that it would have been impossible to present one by one without it. Moreover it is a very frequent manner to arrange Brazilian music, a bit like if we choose among ingredients already sophisticated to compose a final recipe. 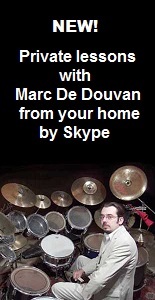 Marc Douvan, February 2006, translation in English: May 2013. These audio recordings are played by myself at a relatively slow tempo for samba, which is usually played very fast (unlike the Bossa Nova). The specific techniques induced in fast tempo (multiple rebounds notably for repinique, etc.) imposes also a very specific "swing" called "suingue" in Brazil, which is (unlike blues or jazz swing of the USA), to accelerate on each beat and slow down before the beat (the chabada begins on the first stroke with the repinique with one stick in samba, and the third in jazz, in syncopation). This is commonly called play "by pushing" (which gives a feeling of energizing and lightness), on the opposite of the rock or blues playing "deeply" (which gives a feeling of "broken leg" and heaviness). Listen to my demo of standard variation of tamborim or repinique in fast tempo at the description of Brazilian percussion instruments, to have a demonstration of Brazilian suingue at a typical tempo of a Rio carnival samba. This is a difficult playing to catch by ear given the tempo and rhythmic finesse, and it is more felt with practice, which is very long on a single instrument with a single rhythm generally, in the samba schools of Brazil. All this also explains that in the "jazz samba" mix (first with Stan Getz and his same titled album from 1962) Brazilian rhythms, played slowly and by (north) American modern drummers are played without any swing, which became typical of this style and in bossa nova, even in Brazil (also for the reasons of technical gestures mentioned above, but nothing prevents to imitate the fast tempo swing in slow tempo (hard and quite distabalizing for dancers (sensation of acceleration in slow tempo), but common in "pagode")). If this demonstration is in a (relatively) slow tempo and without swing, it is also for pedagogical reasons, to focus first on the general rhythmic structures, the polyrhythm (the placing of instruments in relation to each other) and the gestures, before starting to play faster and trying to integrate Brazilian swing and some stick rebounds. This composition is the result of my practice in the percussion semi-professional carnival Franco-Brazilian band Aquarela from Paris (from 1993 to 1997). It can deviate from some current "academicism", but each samba school (carnival band) in Brazil has its own compositions or playing techniques, although common points exist, and it can change every year (or at least slightly change). It remains, however, that this version of samba of Aquarela (then headed by Denis Julien, his first leader) is very inspired by what for me is his most sophisticated and virtuoso representative musically: the samba school of Rio de Janeiro "Mocidade Independente de Padre Miguel" .